James Stacy made his film debut in Sayonara in 1957, and his television debut in Highway Patrol. He had a recurring role as “Fred” in The Adventures of Ozzie and Harriet from 1958 to 1963. During the 1960s he made guest appearances in television shows, including Gunsmoke, Hazel, The Donna Reed Show, Have Gun – Will Travel, Combat!, and Perry Mason in the 1964 episode ‘The Case of the Simple Simon’. Stacy is perhaps best remembered as a star of the western series Lancer, along with Andrew Duggan, Wayne Maunder, and Paul Brinegar. Lancer aired on CBS from 1968 to 1970. Stacy played the character “Johnny Madrid Lancer”, a former gunslinger, the son of Duggan’s character, Murdoch Lancer. Stacy also acted in several motion pictures from the 1950s through the 1970s, including a minor part in the musical South Pacific. On September 27, 1973, Stacy was taking Claire Cox for a ride on his motorcycle in the Hollywood Hills when a drunken driver struck them. She died and Stacy lost his left arm and leg. Stacy’s ex-wife, actress and singer Connie Stevens, organized a 1974 celebrity gala to raise money for his expenses. The gala, whose attendees included Frank Sinatra and Barbra Streisand, raised $118,000 for his expenses. In 1976, he won a $1.9 million lawsuit against the bar that had served the drunk driver. 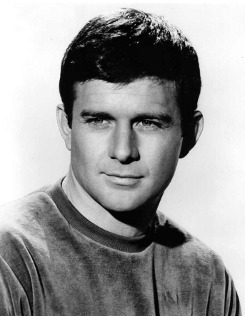 After his recovery, James Stacy appeared in roles created to accommodate his disability. His comeback film was the 1975 Kirk Douglas Western Posse, in which he was cast as newspaper editor “Harold Hellman”, a part Douglas had written for him. In 1977, he starred in the TV movie Just a Little Inconvenience, playing a double-amputee Vietnam veteran. The role earned him his first Primetime Emmy Award nomination for Outstanding Lead Actor in a Drama or Comedy Special. In 1980, Stacy starred in and produced the TV movie, My Kidnapper, My Love. His brother, Louie Elias, a character actor and stuntman, wrote the screenplay, based on the novel by Oscar Saul, to accommodate Stacy’s disability. Elias was also the associate producer. Other television appearances included Hotel, Cagney & Lacey (for which he was nominated for a second Primetime Emmy Award for Outstanding Guest Performer in a Drama Series), and Highway to Heaven. His last TV role was in five 1990 episodes of the cop series Wiseguy, playing “Ed Rogosheske”. On September 9, 2016, James Stacy died of anaphylactic shock in Ventura, California, after being administered an antibiotic injection at the office of Dr. Cedric Emery. He was 79 years old.